This past two weeks of fishing on Lake Texoma have been really good. We have been catching alot of fish on the drop-offs and ledges using live bait. 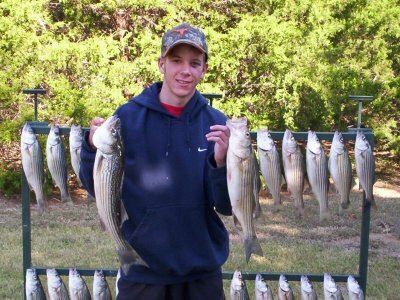 I have been drift fishing quite a bit of the time just to keep up with the schools of texoma stripers as they are moving very fast. I have also had some very good days fishing on anchor when the fish stay in one place. On other days I have anchored down, baited the lines and the stripers just blow through and keep on going. I have been out fishing most of the evenings this past week and was fortunate to find several large schools of stripers working the top water. On your evening trips be sure to have a topwater lure ready and look for frothing water under the working birds. 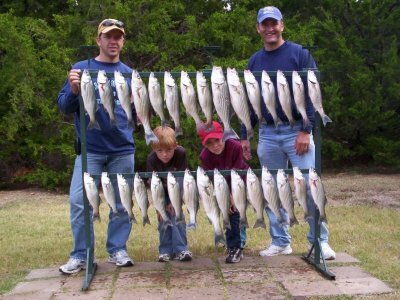 The stripers are spread out all over Lake Texoma. You will also see the seagulls working just about everywhere you go on the lake. The official water temperature of the lake is 65 degrees so during the next 10 degree drop in the water temperature the fishing should be excellent. The 55-65 degree range in water temperature is the prime time for fall striper fishing. So for now I'm using live bait gizzard shad but am looking forward to fishing lures in the next few weeks.